The Barton Creek Golf Academy can accommodate your corporate needs. Suggestive topics: Putting, Chipping, Pitching, Bunker, Full Swing, On Course Strategy, Specialty Shots, Trouble Shots, Driving for Distance, Hitting Irons Close, Psychology, Golf Specific Fitness. The clinics are customized for the low handicap and new golfers. Have a golf instructor speak at your dinner, or opening ceremonies. Brech Spradley can speak about his experience with top players as well as the swing and mental game. Barbara Puett author of golf etiquette can speak on pace of play and etiquette on the course and practice range. This is a fun way to get everyone together and kick off an event. This is a two hour warm up clinic before play. An Instructor will give a 30 minute presentation and walk the line assisting student on the driving range. This 1.5 hour clinic is designed for those who have never played or those wanting a review of fundamentals. It will include Etiquette and Swing Fundamentals. Golf clubs will be provided. This school raises your game to the next level. It is a 3 day course that will include a TPI fitness assessment with 18 personalized workout programs. The Mental Game “Golf Psych” to determine where your mental game compares to those Championship Winners from US Open, Masters, and PGA Championships. This mental assessment includes a 50 page personalized report that will help you greatly improve the way you are thinking around the course. This school also includes instruction in Full Swing through Short Game, Club Fitting and On Course Instruction. Adult Rates range from $125 – $185 per hour. Junior Rates range from $100 – $150 per hour. 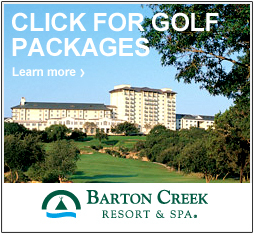 For more information on the Barton Creek Golf Academy, please call (512) 306-5805 or email golfacademy@bartoncreek.com.